The high end Chinese Renaissance has been blossoming for a couple years, and Kizer is arguably the Michelangelo of the movement. Yet there hasn’t been much coverage here of this rapidly expanding segment of the market. Ben has capably covered a couple knives from Kizer including the original Ki3404-A3 and the Vanguard version of the Gemini. I have been curious about Kizer myself, and recently acquired a Rogue and an Intrepid, the subject of this review. Like the Gemini, the Intrepid is another collaboration with custom knifemaker Ray Laconico. But rather than this being a knife from the more affordable Vanguard series, we have the premium offering here replete with S35VN blade steel and sculpted titanium handles. What I find interesting about Kizer knives is their singular focus on quality. This fanaticism has gone so far that they import their materials from the United States and Japan. That doesn’t sound at all like the Chinese manufacturers of yesteryear. I think a review of a modern high end Kizer is long overdue here. The Intrepid has an overall length of 8.25″, a 3.625″ blade, weighs 5.64 ounces, and is made in China. This is the bigger brother to the Gemini, which has a 3.125″ blade a weight of 3.65 ounces, and a much simpler and more “socially acceptable” profile. Although the Gemini is a more practical Every Day Carry (EDC) option, I wanted to check out the Intrepid because we already have an excellent review of the Vanguard version by Ben. Tony does a great job as usual with his review of the dress version. The Intrepid is bigger and badder than the Gemini, and it features a large modified clip point blade. I always enjoy a good clip point, and this one is no different. Actually, it’s a little different in that the blade has a harpoon, but it works much like a regular clip point. The draw to the harpoon is that it makes for a good thumb rest and funkier looking knife. I like the unique blade shape. The hollow ground blade gets thin behind the edge, and the edge itself has been evenly ground. The swedge and belly meet to form a needle sharp tip. Although they are more aggressive looking, clip point blades are well rounded performers, and this blade is great for a variety of tasks. 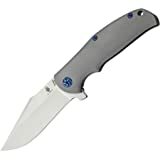 Kizer selected CPM-S35VN steel for the blade. S35VN is a popular choice, and I’m glad to see it here. This is an American steel made by Crucible with input by Chris Reeve, and the end result is a blade steel that is a little tougher and easier to sharpen than S30V. It also finishes nicely, and the blade of the Intrepid comes with a nice stonewashed finish. I have carried and used my Intrepid extensively. I continue to be impressed by the ease of maintenance and edge retention on S35VN. My knife came sharp straight out of the pouch and I have used it for a variety of domestic chores including breaking down boxes, working around the house, and a little woodworking now that the weather here in Florida has finally cooled off. S35VN blade steel is all well and good, but what really impresses me with the Intrepid is the handle. Here we have full 3-D contoured titanium handles. These handles are milled, not cast, and if you look closely you can see the cutter path You just don’t see much of this. Probably the closest competitor I have reviewed with contoured titanium handles is the Spyderco Slysz Bowie. The Slysz Bowie is immaculate, but it’s also nearly $100 more than the Intrepid. This 3-D contoured handle comes with all the fixings you would expect in a premium titanium framelock flipper: oversized pivot, steel lockbar insert and overtravel stop, and a blue anodized titanium backspacer. Fit and finish is perfect on my knife. Being a larger knife, the Intrepid has plenty of room for your hand and should accommodate most people with ease. The finger groove and broad spine both naturally draw in your hand. This is a comfortable piece that works well. There isn’t much in the way of a “traction plan”, but somehow the knife has managed to stay in my hand. The bead blasted titanium offers a little traction, and in my opinion the lack of jimping is a pleasure, not a curse. If you want something a little higher traction then I’d probably suggest the G10 handled version. The pocket clip is understated when compared to the rest of the knife. This is a simple folded titanium clip, and the only adornment is the fact that it has been anodized blue to match the hardware and backspacer. That’s OK with me because the clip works. It has excellent spring retention and the knife stays firmly in place – even when clipped to lighter fabrics. This is a big knife, but it carries like a smaller blade thanks to the strong clip and slim handles. The only potential negative is that the handle is only drilled and tapped for right side tip up carry. Not a problem for me, and I’d hate to see them drill any more holes in this handle than absolutely necessary. The Intrepid is a flipper on caged ball bearings. The bearings are smooth and the blade flips with authority. For people that like metrics, I’d say it’s a strong “8” on my 1-10 flipper action scale. It flips only crisply and reliably every time. The flipper tab is large, angled, and easy to get at. There is no jimping on the flipper tab, but once again we don’t need it. Clearly the guys at Kizer have spent some time studying the American flipper market and know what we want. This thing sings. For lockup we have a titanium frame lock. This lock has been outfitted with a stainless steel insert that doubles as a lockbar stabilizer, much like the Spyderco Domino and some of the Zero Tolerance flippers. Lockup is early without being too early, and secure without being sticky. Lockup is also rock solid. No blade play, no wiggle, and no tweaking required. I’d say the flipping action and lockup is on par with Zero Tolerance, a company known for making some of the best production flippers in the business. I was wrong to wait so long to check out these Kizer flippers. The Intrepid has everything I look for in a titanium framelock flipper and then some. Here we have a great design, premium materials, superb fit and finish, nice details, and a dialed in flipper. This is a bigger knife, but it carries like a smaller knife, and for a little over $200 you are getting a lot for your money. The 3-D machined handle is what sets the Intrepid apart. Offhand I can’t think of any production titanium framelock flippers with fully contoured titanium handles. The Intrepid is about the same size and thickness as the recently reviewed Hinderer MP-1, but it feels slimmer and more than .2 ounces lighter (the difference on paper). Granted the Hinderer is a tank and this is something of an apples to oranges comparison, but I still find it interesting to juxtapose these knives. The build quality on the Hinderer is superior, but the Intrepid is a special knife in its own right. I recommend Intrepid if you are looking to scratch that higher end titanium frame lock flipper itch. There is a lot to like here, and again I can’t think of another flipper that has a handle like this. I think the Vanguard version will also be a good buy if you want something at a more approachable price point. And check out the Gemini if you are wanting a more urban friendly EDC. Either way I don’t think you will be disappointed with these Kizer / Ray Laconico collabs. I recommend purchasing the Kizer Intrepid at Amazon or BladeHQ. Please consider that purchasing anything through any of the links on this website helps support BladeReviews.com, and keeps the site going. As always, any and all support is greatly appreciated. Thank you very much. It has a place that you can use as a forward choil of sorts, but there isn’t a whole lot of space. I don’t really use the knife that way. It’s doable but I would be careful. Sorry, I wasn’t clear in the review. In the review I was referring to that finger groove in the handle. I’ve fixed that (and thanks for pointing this out). However, that small space between the flipper and where the edge starts can be used as a forward choil. It’s small and I would be very careful about using the knife that way, but if you are careful it’s possible. The Kizer-Ray Laconico collabs are wonderful. And they keep getting better. Wait ’till you get your hands on the new Mini Intrepid with M390 steel. It’s a 3-inch blade. Perfect size for pocket EDCing. At $250 street it’s pricey compared to the previous models. But Kizer keeps making incremental improvements in fit and finish. The Mini Intrepid is the best Laconico-Kizer collab yet. Each of my Laconico collabs has worked perfectly. And that ‘s a good thing. Because, to the best of my knowledge, Kizer has no warranty service within the US. I have seen reports of Kizer sending replacements parts for free from China. But anything that needs fixing must be returned to the factory. I’ve never had to do that with a Kizer. And I hate to bring this up — the Kizer workmanship is first-rate. And you can just see how hard the Kizer folks work to get these knives right. These are high-quality products. But stuff happens, and last year, I had to return a knife for service to Italy — to Lionsteel. For months, I never heard whether or not they had received the package. One day, it just showed up back at my doorstep. It’s worked fine ever since. Lionsteel, like Kizer, is a reputable company. Even so, considering the prices of these products, I wouldn’t care to go through an experience like that again. Thanks for another fine, thoroughand readable review. Thanks as always for taking the time out to comment. I enjoy getting your perspective, and in this case it’s no different. A Mini-Intrepid sounds excellent. I wasn’t sure exactly what to expect from this knife, but I have to hand it to Kizer. They did an awesome job. Admittedly a smaller knife would be more practical for me, so a Mini Intrepid may very well be on my horizon. You raise an excellent point regarding the warranty work. I have stripped the screws on my Fantoni CUT Flipper, and haven’t even tried to reach out to them to see if it is something they would fix. If it was a Benchmade, Kershaw, etc., I would have already sent it in for repair, so your comment on the warranty work for these overseas knives is spot on. Oddly enough, I have had international readers tell me they are hesitant to buy a Benchmade because they would have to ship it here to the States for work. I guess it’s just the global economy we live in. Either way it’s a great point and well worth considering. It would be nice if Kizer set up some sort of warranty department here in the States to act as a liaison to China for repairs and such. Not sure of the feasibility of something like that. Kizer keeps shrinking the size and improving the quality of its original Intrepid. In addition to the 3.625-inch blade Intrepid, there is a 3.125-inch model dubbed the Ursa Minor. A dealer in Carmel, CA (Carmel Cutlery) is a friend of Ray Laconico and has an exclusive on them. The Ursa Minor has blue trim like its larger brother. And a really nifty, milled clip. Kizer should share that version of the clip with its other models. Kizer describes its new Mini Intrepid, with a 3-inch blade, as a limited edition of 500 knives. It’s a more compact version of Laconico’s custom Bear model. Unlike the two larger collabs, the Mini has an open-pillar construction with standoffs instead of a backspacer. The trim looks better to me not being blue like that on its two larger brothers. The Intrepid/Bear is a popular design. Maybe as popular as the Gemini. Kizer is smart to produce smaller, lighter and more pocketable versions. Kizer has added some other smaller, limited edition models with M390 steel to its line: the Mini Dorados and the Mini Flashbangs. All with 3-inch blades. I would love to see Kizer shrink the wonderful Gemini design to a 2.75-inch model. Look at how popular the Chris Reeve Small Inkosi and Mnandi have become in that size category.